The Editor of Confused Eagle has just finished briefing Members of the Farmville Area Ministerial Alliance. This was part of the concept of "Acting Locally and Thinking Globally." The Editor of Confused Eagle wishes to Thank the Members of the Clergy in the Farmville Area for this Opportunity and looks forward to Further Opportunities to explain US Policy Issues regarding to Africa. One of the Topics that the Editor of Confused Eagle has posted items about on Other News Portals has been Operation Lightning Thunder. Lightning Thunder was an Operation Conducted by the Ugandan People's Defense Force (UPDF), The Armed Forces of the Democratic Republic of the Congo (FARDC) and the Government of Southern Sudan. The Bush Administration ordered AFRICOM (United States African Command) by Executive Order to Assist in this Operation. The Support provided by the US Military amounted to Satellite Photos, Observers on the Ground, Communications Gear and $1 Million in Fuel. These Activites were seen by some Observers as a failure for AFRICOM. The Advocacy Group ENOUGH! has recently published a Paper called "Finishing the Fight Against the LRA." This Paper calls upon the United States to take a lead role in finally defeating the LRA. Is this a Good Idea? When it comes to the Activities of the Lord's Resistance Army the US has not been silent. The LRA is on the Terrorism list that has been put together by the State Department. In 2005 Congress sent a Fact-Finding Mission to Northern Uganda to see how the Northern Uganda Crisis Response Act which was passed by Congress and signed into Law by President Bush in 2003 was being implemented. The Government of President Museveni has had close relations with the US since it came into power. On at least two occasions the White House reportedly signed off on Two threatened Ugandan Invasions of the DRC since 2005. The LRA and the Museveni Government reached an Agreement on a Peace Accord last year. Twice the Accord was to be signed. Both Times Joseph Kony did not show up at the Signing Ceremonies. So what interest does the US have in this situation? There are two reasons for this. First of all there is a Vibrant Activist Community concerned with the Situations in both Northern Uganda and the Democratic Republic of the Congo that wants the threats by the LRA to end. Secondly no matter how poorly it was implemented the fiasco of Operation Lightning Thunder must not be allowed to lapse. 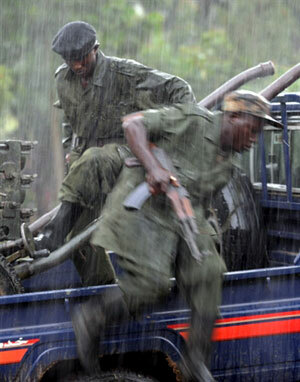 Reprisal Raids by the LRA have occured in both the DRC and in Sudan. And there were reports in late Feburary that the LRA ambused an Central African Republic Army Patrol as well. This is a Multi-National threat that needs a International Solution. The Paper by ENOUGH calls upon the US and other Concerned Actors including the UN Department of Peacekeeping Operations to apprehend the senior leadership of the LRA. There is also a call for the International Criminal Court to Investigate the Recent Actions that have been taken by the LRA. Senior Leaders of the LRA have already been indicted by the ICC already for Crimes Committed in Northern Uganda since 1986. There is also a call for the repatriation of those Abducted by the LRA in the Past and the Protection of those who have been kidnapped recently and currently are in the Ranks of the LRA. The Last Paragraph of the Paper begins as follows: Abandoning the Mission to end the LRA now will have disasterous Consequences for the Civilians in Central Africa."